Regionalism at certain points in history has seemed like a liberatory notion. For Ken Frampton, author of Modern Architecture: A Critical History, for instance, a “critical regionalism” offered a way of resisting the international style and (boring) corporate culture it represented. But based on my most recent trip to the Ft. Hamilton Parkway stop on the F line in Brooklyn, I couldn’t help but feel that the notion of the regional is under threat. A series of posters all seem to both invoke local identity and suggest the ways that it destabilized. As far as I can tell the dis-ease has dual aspects. On the one hand, local legend of disaster can re-emerge or be re-evoked for the thrill. On the other hand, current conditions of globalization offer a kind of nostalgia for the regional that is something that can be exploited. The sad part is that the local ends up getting exploited coming and going, while real localities find themselves under a double threat, one from the global capital which mines profit, and the other from the media which play a game of exploiting the name recognition of the local as a place under threat, but stay well away from making links to the perpetrators of the crime. 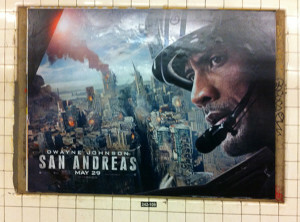 This film is billed as an “action-adventure disaster” pic. It offers a modern riff on the 1906 earthquake disaster. The plot features a couple going to a quake-destroyed SF to rescue their daughter. Naturally, most of it is shot in Brisbane, the one in Australia. Next we move slightly south… Here the comedy plays out: Four white guys and one south asian get rich by playing it stupid. Their job is reassuring us that the glaring inequalities (the lack of women, blacks, latinos and everyone else in the picture is not an accident) that come along with the new technologies coming out of Cupertino are just a joke. The third poster on the wall I came across was from the East Coast. The Whitney is moving. These days the neurotic angst of midcentury alienation can be revisited as something cute. For us, we wish we had problems so small, and an art so resistant to the savage destruction of human compassion. Instead we get a museum that can turn its collection into pastiche in the interests of boosting land values along the High Line. Where are the Masses When we need them? I am pleased to note that Interference Archive has put up a piece I wrote about the Film and Photo League documentary collective from the 1930s. The piece emerged from a presentation of the FPL at the Archive (with live music!) 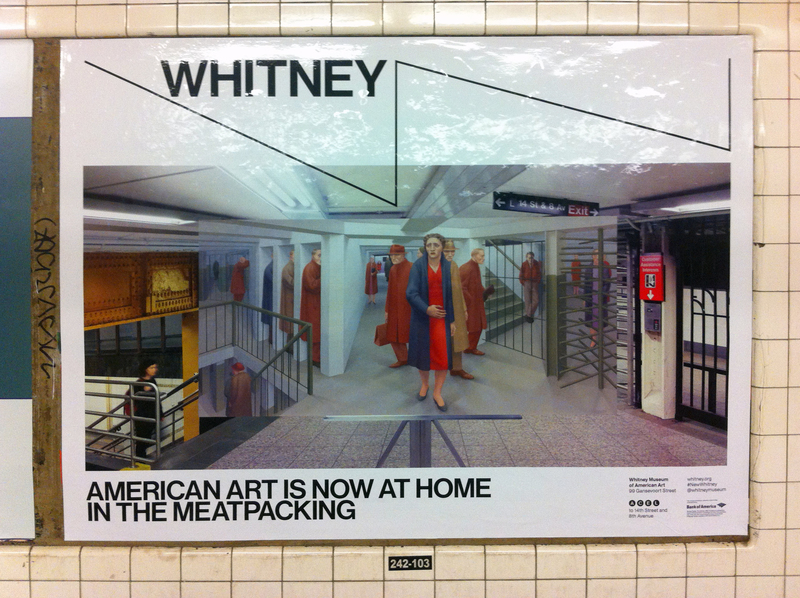 in 2013 that was part of the “Strike Anywhere” Exhibition. 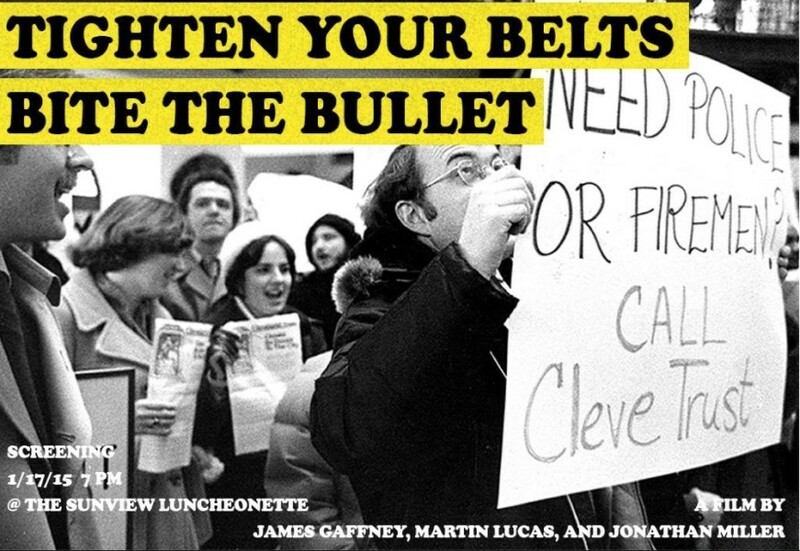 I am happy to say that the Sunview Luncheonette is hosting a screening of Tighten Your Belts, Bite the Bullet. This was my first documentary, and the title comes from a line in the film spoken by Adam Veneski, the founder of the People’s Firehouse, in Greenpoint, Brooklyn, not far from where the film will be shown. The screening is co-presented by Neighbors Allied for Good Growth (NAG), Interference Archive, and the Sunview. Brian Winston opens Codes and Modes with a veritable tsunami of a keynote. If you think they’re investing in public education, think again. This “campus” is part of a trillion dollar effort to revamp America’s nuclear weapons industry. That’s right, new bombers, missiles, subs, a complete national relapse to the depths of Cold War madness. Apparently it is clear to US politicians that recent threats like the situations in Eastern Europe and the Middle East will respond well to the threat of global obliteration which is still, very clearly, the heart of security policy. The photo is from a New York Times article from Sept 22, 2014, “US Ramping Up Major Renewal in Nuclear Arms” by William Broad and David Sanger. This push on the weapons side is accompanied by an exciting new initiative on the nuclear energy front. The Nuclear Regulatory Commission has declared that it simply won’t be necessary to bury any nuclear waste in the US. The decision, announced on August 27th, 2014 (See: http://nrc.einnews.com/article/220571519/rzEpj67MSFKa6uMr basically means that nuclear waste can be stored as long as plant operators want on site. This basically means that the NRC is acknowledging that it has given up on any plans for secure storage of nuclear waste in the foreseeable future. Burying nuclear waste was never a great option. The fact is, no place in the country wants to take it. Now, we can bury our heads in the sand instead! 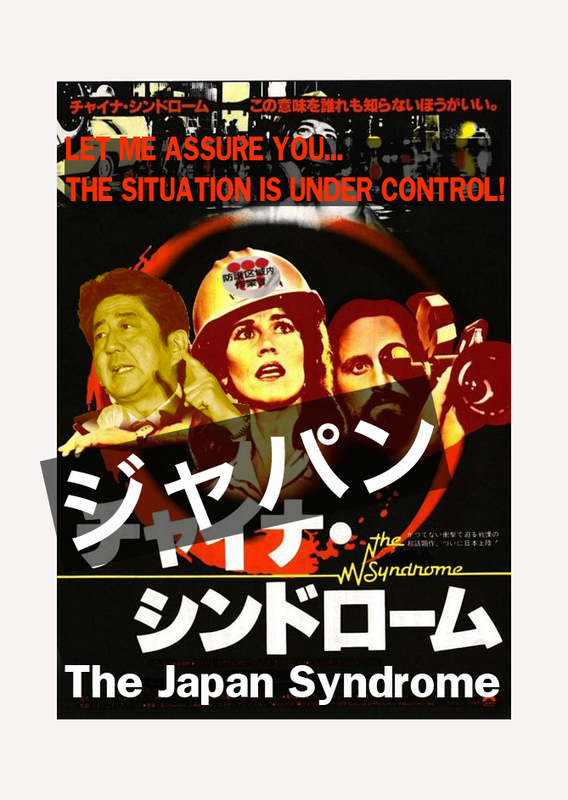 It’s hard to believe, but the Japanese government finally has a solution for the ongoing mess at the Fukushima Daiichi Nuclear Power Plant… It’s called denial. Prime Minister Abe’s government is pushing through an official secrets act that offer draconian penalties for revealing government information. The lower house of Japan’s Diet has approved the bill and the upper house has until December 6 to debate the bill. The Japan Times story gives a good sense of the direct link between the new secrecy laws and the Fukushima disaster. 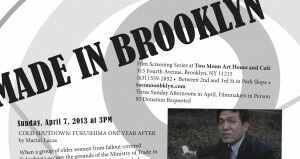 See also the New York Times coverage which makes the link to Fukushima clear. There is a movie here, but I don’t think it will be made. The quote is from Prime Minister Abe dismissing concerns about Fukushima to the Olympic Committee in Argentina. 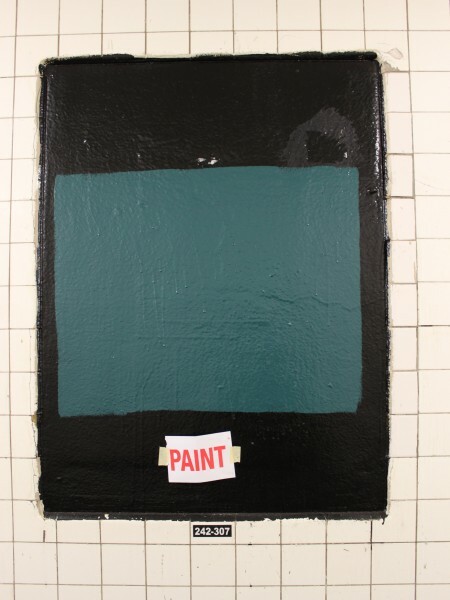 A return to classic modernism at the MTA. At the second anniversary of the 3/11 earthquake, tsunami and nuclear disaster, the de-nuclearizing movement in Japan is continuing to grow both in size and in international significance. 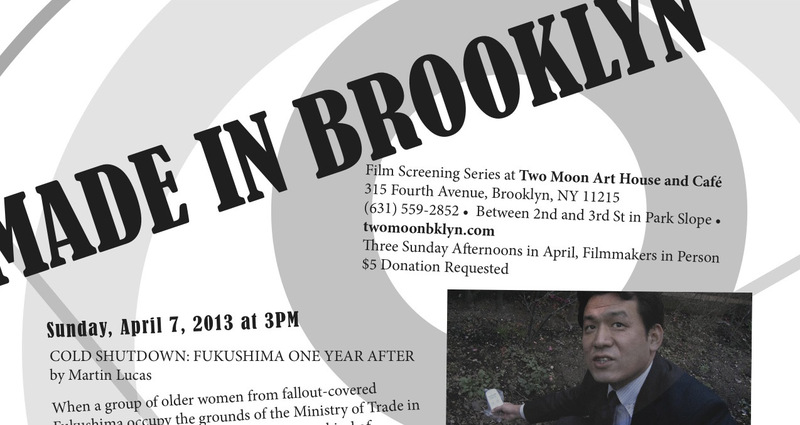 MADE IN BROOKLYN – 4 Films by 4 Brooklyn Filmmakers. 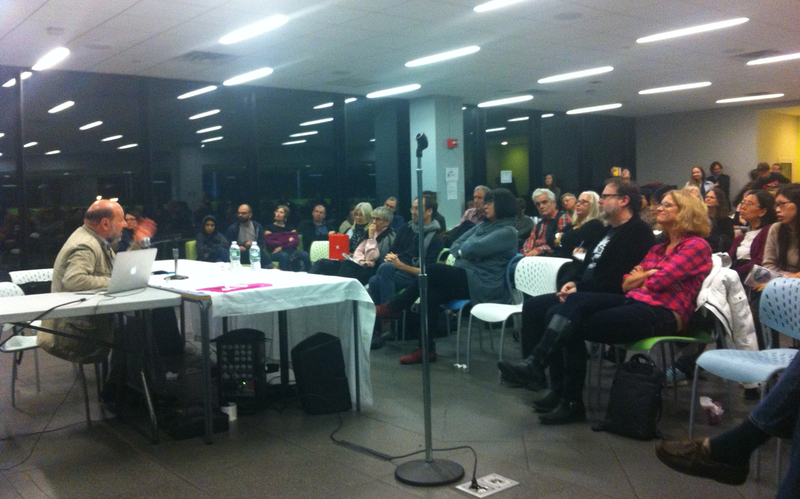 The event is hosted by Tami Gold. Please let folks know, and, of course, please come! I was taking the IRT downtown on a busy afternoon recently. On the 68th St platform I ran into Ivone Margulies, a colleague in the Film and Media Studies Department at Hunter College I hadn’t seen in a while. When the train pulled in we were lucky enough to find seats. As we sat in the busy car I asked her how things were going. Ivone, a film scholar who has written on Chantal Akerman, updated me on her book on cinematic realism. I, a documentary filmmaker, told her about a film I have been working on for the last several years, called Hiroshima Bound. In the film I use my own childhood memories of parents involved in research on nuclear weapons and high energy physics to explore the role of Hiroshima in American memory and my own sense of what it means to be responsible for that historical legacy. I have been particularly interested in flushing out the history of visual representation, examining the legacy of Japanese and American photographers who took still and moving images in the days and months right after the events of July 16, 1945. “You’re from New Mexico?” I asked. This young man in his early twenties, Latino, in a suit jacket that was a tight fit over a big body was super earnest. And almost sweating with passion. Speaking loudly, from necessity, and partly from conviction, he told us that he came from Las Cruces, near the south end of the White Sands Proving Grounds. This was an event he both remembered and felt strongly about. In fact, you could say there were two events, the original explosion, and his own trip many years later. 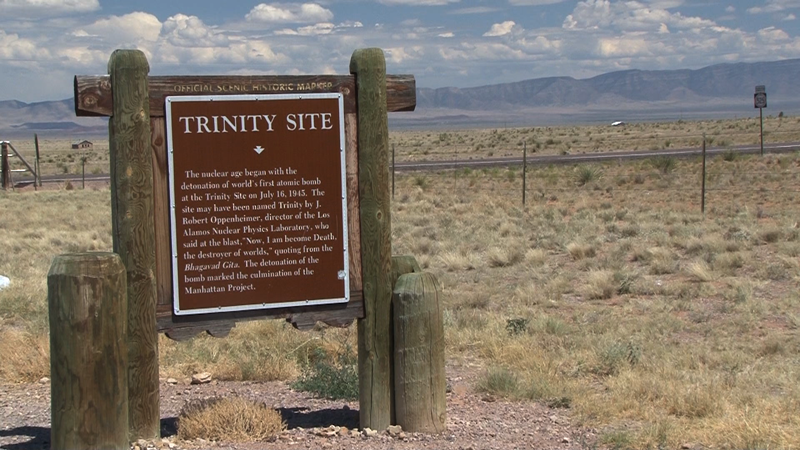 He reiterated how important it was for people to be aware of the legacy of the Trinity bomb, exploded July 16,1945 at the White Sands Proving Grounds in southern New Mexico, and still reverberating today. Ivone and I looked at each other. “That was in the Seventies.” She went on about how her friend was developing lasers for the military because that was where you could get a research grant at that time. I told her that I was also interested in the instrumentalization of science that she described, and the bending of research to defense-related goals. That I was trying to figure out how to portray that in a film. As the 6 train continued to rattle its busy way downtown she went into more detail. “I saw it twenty years later in the first Iraq War. The fuses on the smart bombs… I’d seen them in development.” The woman couldn’t let go of her story or it wouldn’t let go of her. This is the F train. Manhattan. New York City. The winter of 2013. The young man and the academic both got off at Union Square. This is a country that is waiting for a chance to talk about this story, about this killing myth. A country that somehow feels these events still bound in passion despite sixty years of myth-making and trauma.